When my former Addis Ababa housemate and fellow teacher at Tafari Makonnen School, Garber Davidson, told me that a former TMS student of ours, Abebe (now known as “Abe”) Abraham, would be coming with him and his wife Sally to the reunion lunch of our Peace Corps “Ethi III” group in September 2011 in Washington, Abebe’s face came immediately to mind. 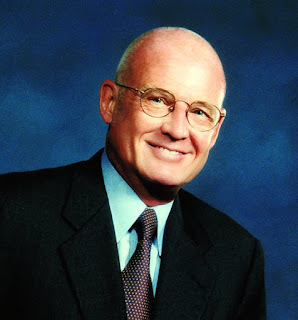 He’d made an indelible impression in my tenth grade English class at TMS – not only as a serious-minded and hard-working scholar at the top of his class, but also as a tremendously outgoing, socially adept young man who made friends easily. There was no question in my mind that, God willing, Abebe would succeed at whatever professional path he chose, and I was delighted to learn when we reunited in 2011 that he’d founded a highly successful firm in 1989, CMI, whose mission is “to provide management and support services utilizing innovation, technology, and knowledge-sharing to improve performance and reduce operational costs.” He, as President & CEO, and his wife Azzi, as Chief Operating Officer, work closely together at the helm of CMI, which has been featured in the Black Enterprise “Top 100” list for three consecutive years. 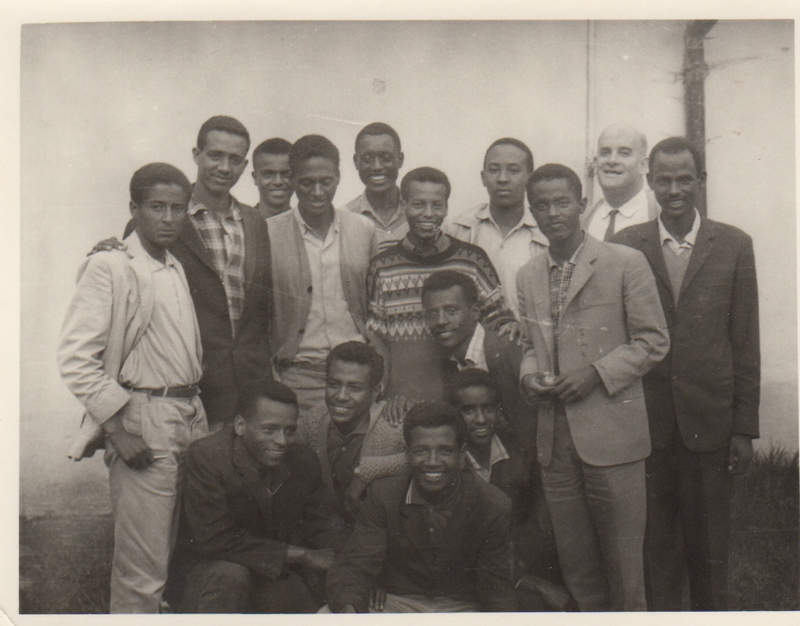 TMS students at my home in Addis Ababa in 1965; Abebe second from the left, second row, and former TMS teacher Michael Altman standing on the right. 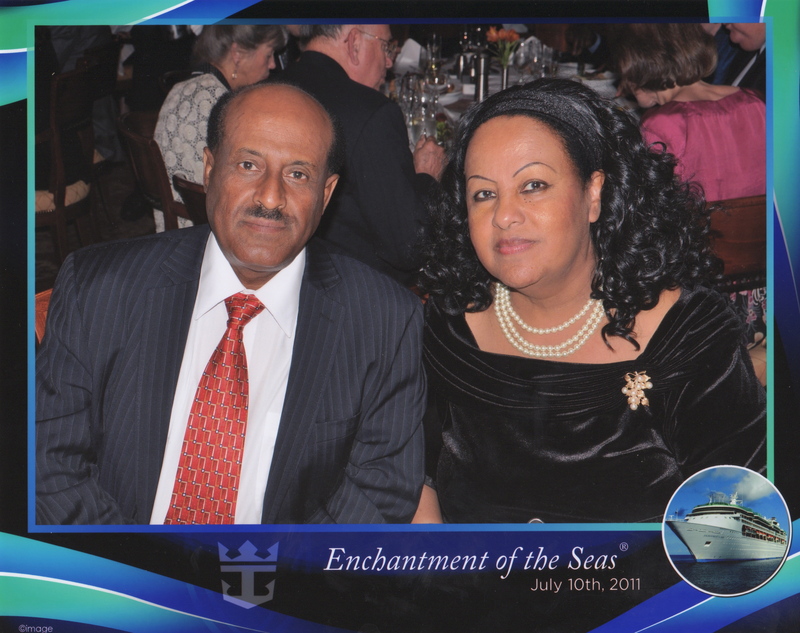 It gives me great pleasure to publish Abebe Abraham’s fascinating audio memoir at entwinedlives.com. 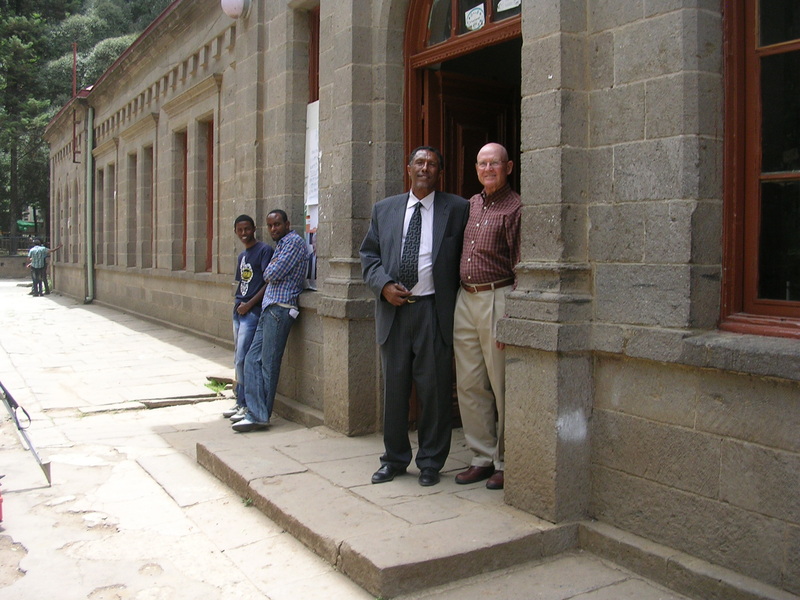 Over the course of a half-hour, Abebe describes his experience as a TMS student, reflects on Emperor Haile Selassie’s place in Ethiopian and world history, talks about the life he has built in the United States, and shares his thinking about Ethiopia’s future. My father used to tease me by saying that I enrolled in TMS because of a natural disaster. The disaster was my voice. It sounded so bad to him it shattered his lifelong dream of proudly presenting me to Yeneta Afework, his old teacher, and to Head Priest Melake Hayl Tedla of Intoto Raguel. I still remember those painful contortions of disgust and disappointment that used to form on my father’s face every time he made me practice the songs of the Holy Mass. After two years of rigorous and often desperate coaching, he gave up on me and realized the inevitable. His first born son was not blessed to serve the Lord as a deacon. It just was not meant to be. So he took me to TMS to try my luck with the “Ferenji” education. Fortunately, all of the drilling and discipline I endured during my father’s coaching helped to make me a good student at TMS. I always stood first, second, or third in my class. I was also blessed with inspiring and nurturing teachers like Ato Abebe Techan, Abba Meaza and “Ato Aseffa the scientist”, who always captivated me and opened new worlds of imagination in my little mind. I used to look up to the senior students and always wondered if I would ever grow up to be like them. They were giants in my mind, whose alleged talents and exploits were exaggerated beyond belief. …….. Ferocious fighterslike Mebrahtu, Cheffikey and Tigabu; great runners like Makonnan Dori and Seyid Moussa; boxers like Girma Drsom, Debebe Eshetu, and Haile-Michael Demisse; and sports heroes like Itana, Iyasou, Tezerra and Tesfaye Gelagai. High school was full of happy days. The teachers were not like those grade school teachers such as Seife and Akalou, who surely would have been jailed for child abuse had they been teaching in this century. There was no more corporal punishment by Ato Sebhat and Ato Fresenbet, not to mention Ato Birru, whose full-time job was to administer beatings and lashes to unfortunate students day in and day out in Mr. Gagnon’s office. Some afternoons as he walked back to his home, he used to complain to us of his tired arms from too much work! Yes, from dishing out too many lashes for too many bad students! I was immersed in the Boy Scouts at TMS. I prided myself on earning and collecting merit badges. 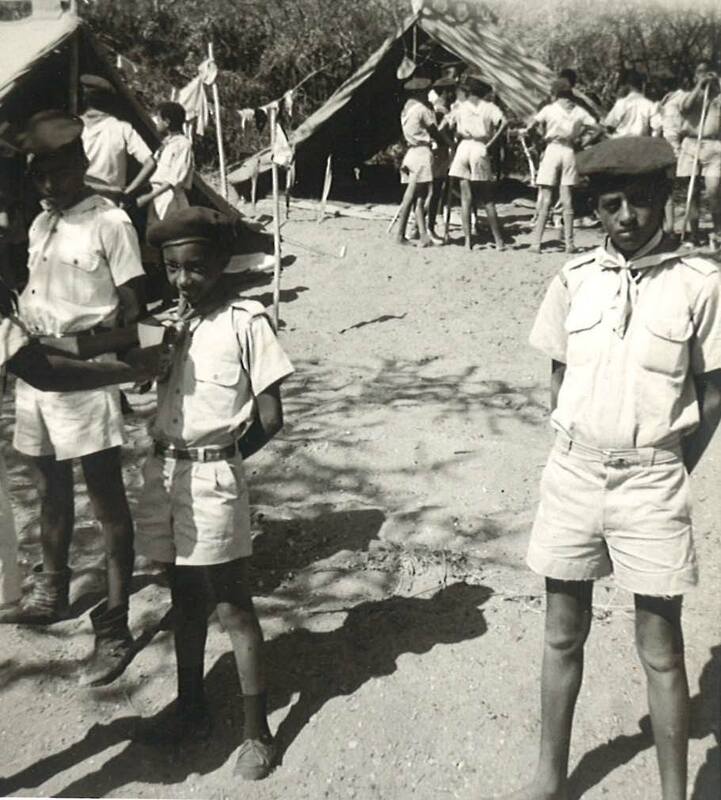 I enjoyed the campfires, hikes, trips to nearby places like Tinsis, Washa-Mickael, and Akaki’s AZ pool (named for Alemayehu Zegeye), Mennagesha, as well as far away places like Awassa, Langano, Chercher and Harar. Our scout master Father Beaudry’s devotion to us was unparalleled. Every opportunity he got, in groups large and small, or individually, he never tired of counseling us. He convinced me to become a doctor. “Healing the sick, caring for the poor is a noble profession pioneered by St. Luke and Christ himself,” he used to repeat to me. 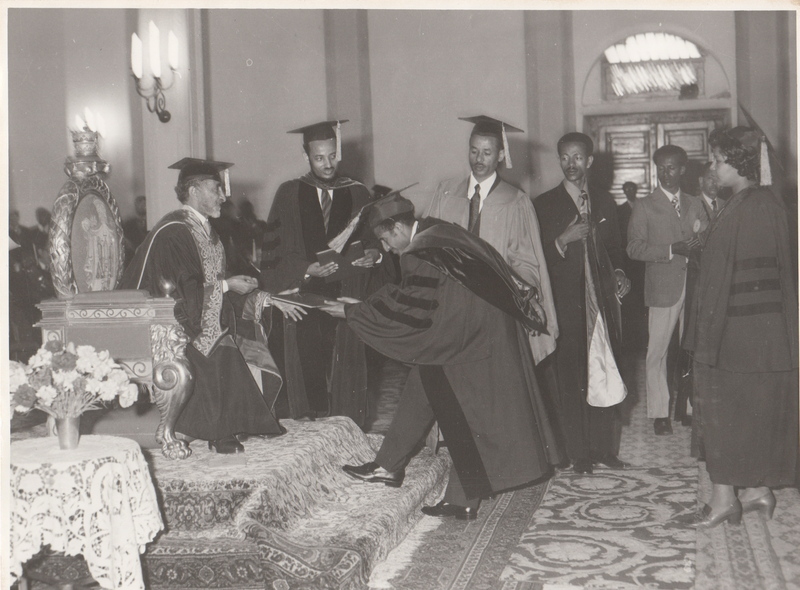 I, therefore, abandoned my favorite subject, geography, and Father Turenne, my geography teacher, to join the Faculty of Science at Haile Selassie University. In 1965 the Arat Kilo campus was almost like a foreign land to me. The faculty, the students and the whole political atmosphere felt strange and hostile. 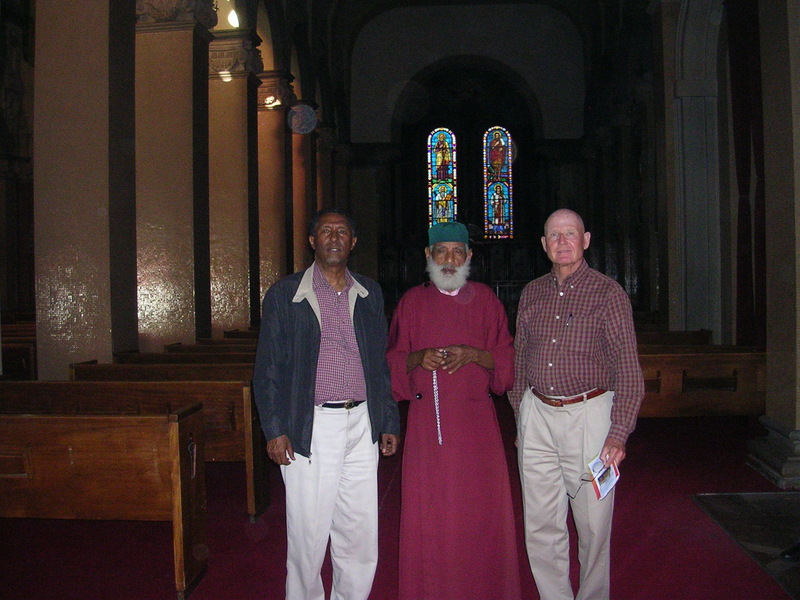 By the next year even some of my own alumni from TMS shocked me by their new-found iconoclastic views: contempt and condemnation for everything we had held dear in our hearts – for Ethiopia, America, the Emperor, God, our Church, our history and our culture, etc. Street demonstrations, agitation, condemnations and class boycotts became common events. By the time I graduated and went to Bahr Dar as a junior doctor, the political mood of the country had changed so much that revolution was imminent. For two years, Bahr Dar became my little heaven. I had everything I needed: a lakeside bungalow, a second-hand Volkswagen and a small rubber boat to take me to my own private island in Lake Tana – a small uninhabited island near Kibran Gabriel, where I spent weekends alone or with a few select buddies. At the airport in June 1974, as I boarded a plane to the USA for four years of training so I could return home to become a famous specialist, I remember thinking about a book called “Montezuma’s Daughter” by Rider Haggard. In the book, the narrator, leaving England for the Americas to avenge his mother’s murder, bids farewell to a villager by saying, “So long.” Upon returning home after twenty long years of unexpected adventure, when he met the same villager, he remembered that and observed, “I never thought how long ‘so long’ was.” In my case “so long” lasted thirty-one long years before I returned to Ethiopia in 2005. Ethiopia exploded in 1974, three months after I left. The Emperor was deposed. So many high officials were executed! So many students, so many innocent citizens were massacred! So many perished for nothing ! The Red Terror was in full swing. In 1978 when my own mother pleaded with me not to return home I knew things were really bad in Ethiopia. It also put me in a dilemma. I had to adjust my status here in America. The thought of applying for immigrant status felt so shameful and degrading for a proud Ethiopian like me that it almost paralyzed me with fear. But one day, after my friend, Dr. Ahmad Moen, assured me that to apply for a “Green Card” was neither an act of treason nor a stigma, I did it, and became an immigrant! Only a year later started the flood of hundreds of thousands of Ethiopians to every corner of the earth; all of them including my own brothers and sisters, vying and dying to get the lifesaver called ‘the Green Card’. How foolish I must have been only a year earlier! Years came and years went by so fast: residency, fellowship, moonlighting, private practice, CME, children, marriage, mortgages and meetings – meeting after meeting. Minutes, hours, days, weeks, months and years flew by fast. After every long day of hard work when my body hit the bed, I would always find myself still half a day behind: things to do, bills to pay, projects to finish, deadlines to meet, promises to keep, and, yes, as Robert Frost said, “still miles to go, and miles to go before I sleep.” Multiply that one day by forty years and it gives you the whole story of my life in the United States. Time has flown by so fast that now they tell me I am a senior citizen! Me a senior citizen? Me a grandfather? I can’t believe it. No way, I still cling to my youth, my TMS, and my Ethiopia. I have been fortunate in my life to have a wonderful wife, Abebayehu, three loving children, Eyasu, Lydia, and Joseph, and a granddaughter, Eden. I have been blessed by so many dedicated friends and family members, who make life worth living, as well as many saintly Americans who went above and beyond to make me feel welcome and become successful. Yes, I am the beneficiary of so much kindness from so many people who themselves have so little. This world is full of good people. I will always be indebted to America, my people, my school and my country. Our duty to God and country is to make this world just a little better place for those who are less fortunate than us. I hope TMSAANA will continue to provide us the vehicle. I want to commend TMSAANA and encourage the Board to keep up the good work. 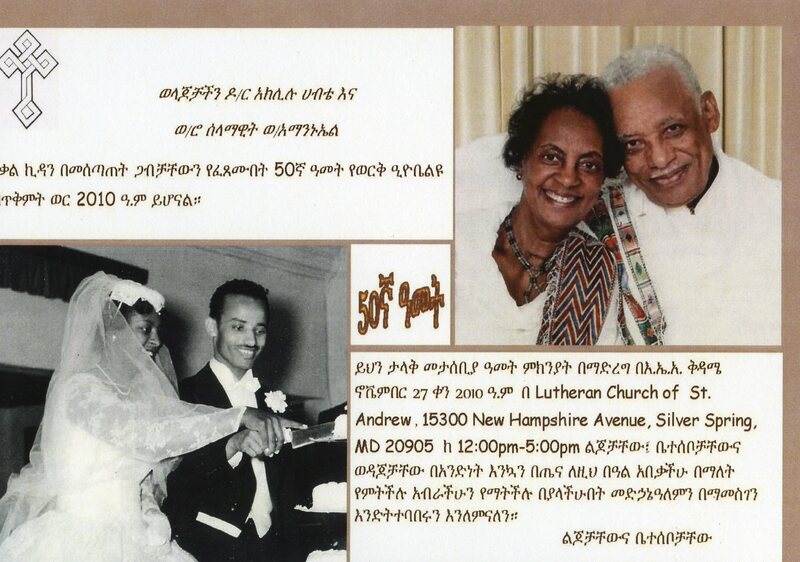 It is both a pleasure and distinct honor to present this memoir by distinguished Tafari Makonnen School alumnus Dr. Aklilu Habte, who recorded it expressly for Entwined Lives. When another distinguished TMS graduate, Bisrat Aklilu, suggested several weeks ago that I contact Dr. Aklilu, whom I hadn’t met, about recording his reflections and reminiscences, I was, frankly, skeptical that he would be willing to spend the time. 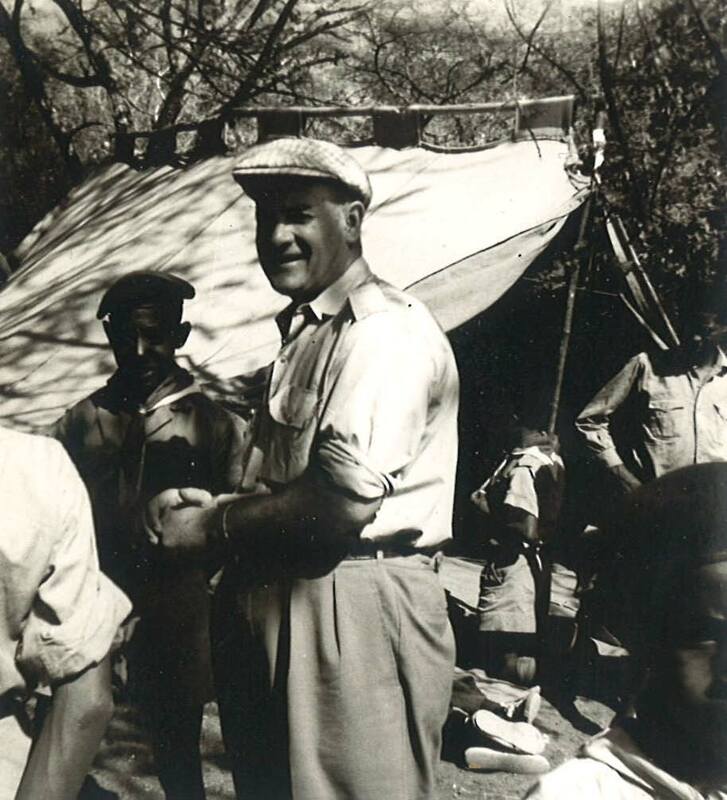 I was aware that he was in the midst of an ambitious writing project – a history of the development of higher education in Ethiopia – and couldn’t imagine he would welcome the distraction. But, thank heaven, Bisrat was insistent, so I telephoned Dr. Aklilu, who, to my delighted surprise, readily agreed to do the recording. Before providing you with an overview of Dr. Aklilu’s illustrious career, I want to thank his son, Ameha Aklilu, who took time from his tremendously demanding schedule as a senior IBM executive to assemble a treasure trove of photographs that you’ll see as you listen to the podcast. 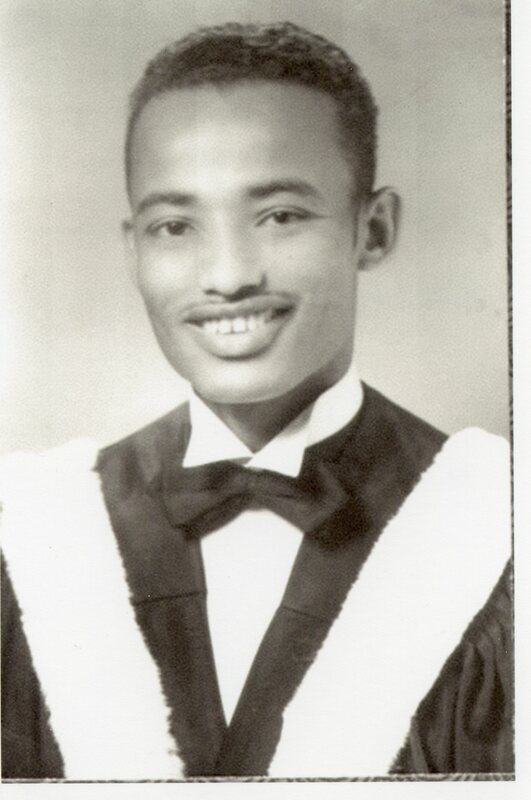 Dr. Aklilu received his baccalaureate degree with distinction from the University College of Addis Ababa (later Haile Selassie I University) in 1954, the Bachelor of Education degree from the University of Manitoba (Canada) in 1955, and the Master of Education and Ph.D. degrees from Ohio State University in 1956 and 1958, respectively. 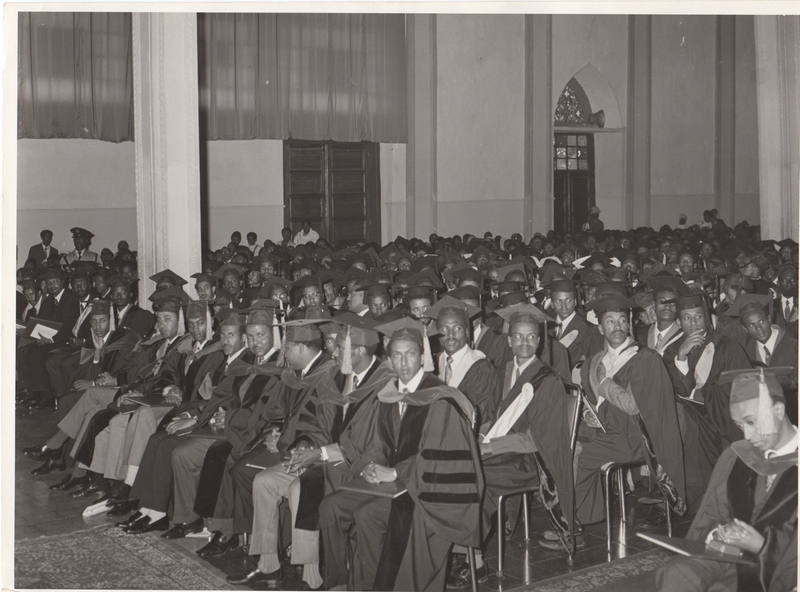 From 1958 to 1969, Dr. Aklilu served as Head of the Education Department, Dean of the Faculties of Arts and Education, and Associate Academic Vice President of Haile Selassie I University, and he was the University’s President from 1969 to 1974. 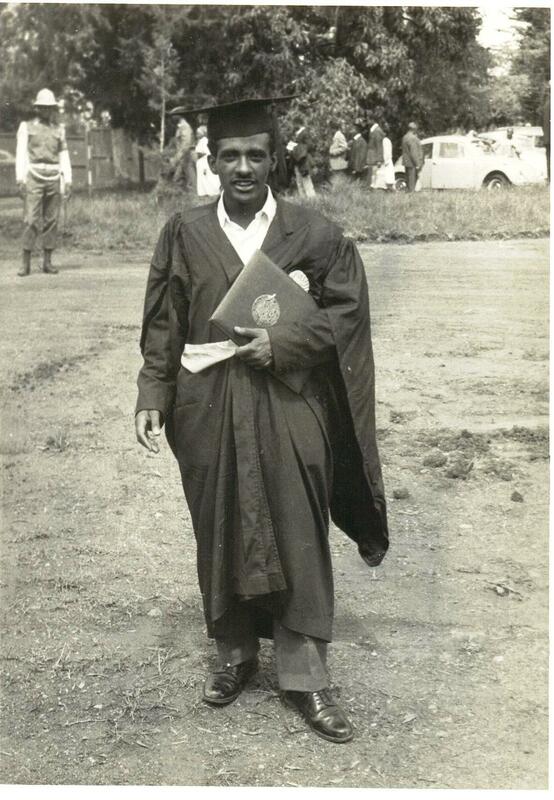 From 1974 to 1977, Dr. Aklilu served as Minister of Culture, Sports, and Youth Affairs in the Government of Ethiopia. 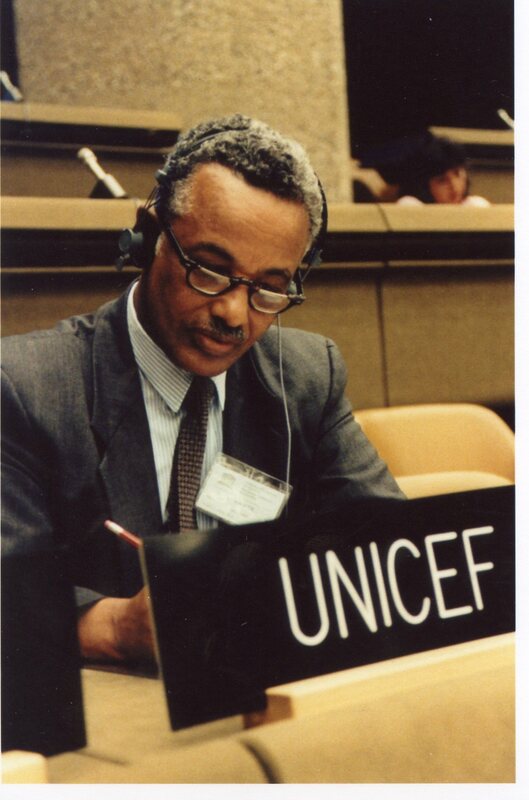 Dr. Aklilu’s long and illustrious career has also included serving as Director of the Education and Training Department at the World Bank and Chief of the Education Division and Special Advisor to the Executive Director of UNICEF. 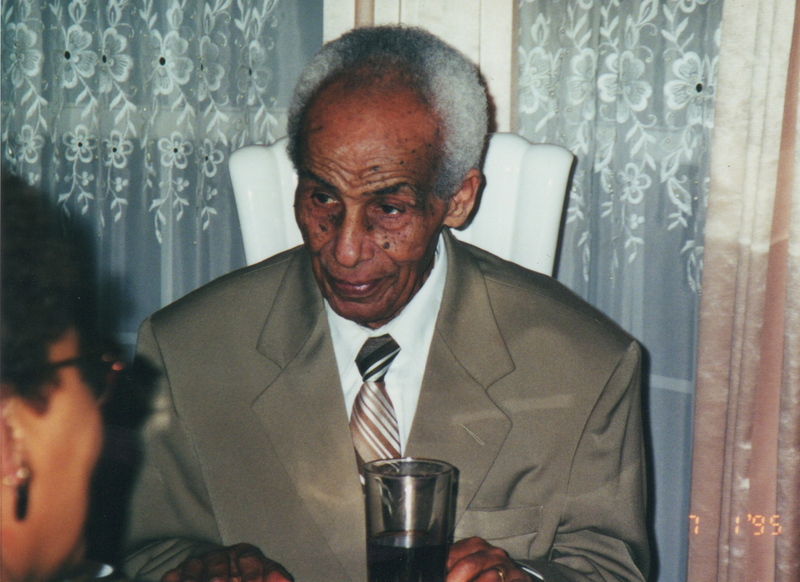 You might recall that in one of my early posts at entwinedlives.com, I wrote that when I got an email from Berhane Mogese not long after learning in March 2011 that the long-lost Tesfagiorgis Wondimagegnehu was alive and well and living in Addis Ababa, I knew for sure that I had to return to Ethiopia for the first time in almost 50 years. 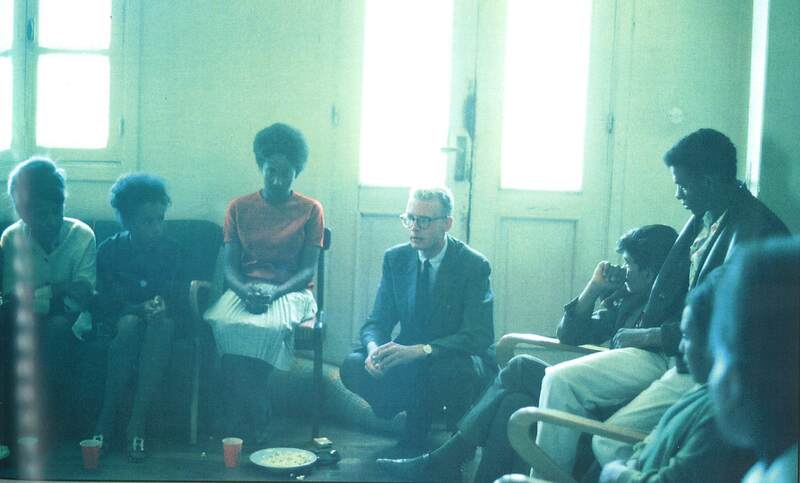 I’d met Berhane my first week in Addis Ababa in September 1964 – at the Peace Corps office, where he was working over the summer, if I recall correctly. 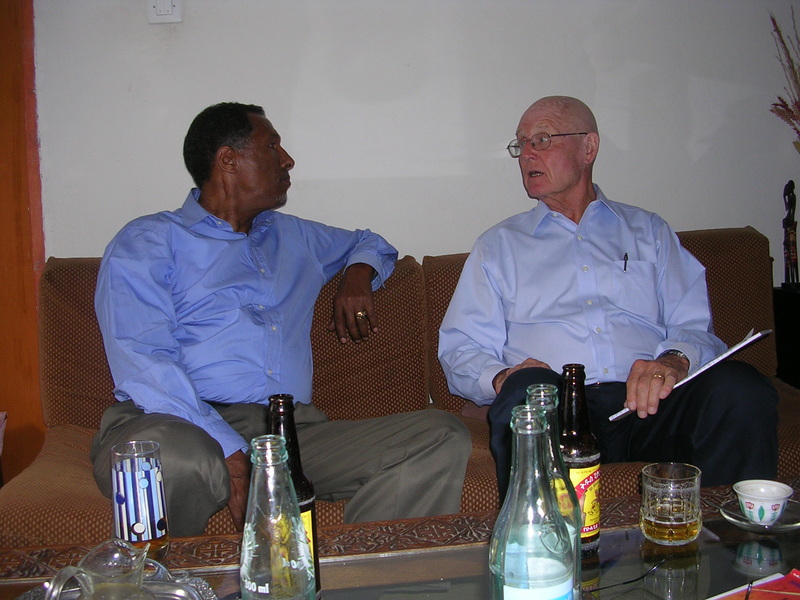 He wasn’t a student of mine at Tafari Makonnen School, but he dropped by my home several times on visits to Addis. A charming, extremely bright, well-spoken young man, Berhane, who was always good company and a welcome guest, clearly had a bright future ahead. 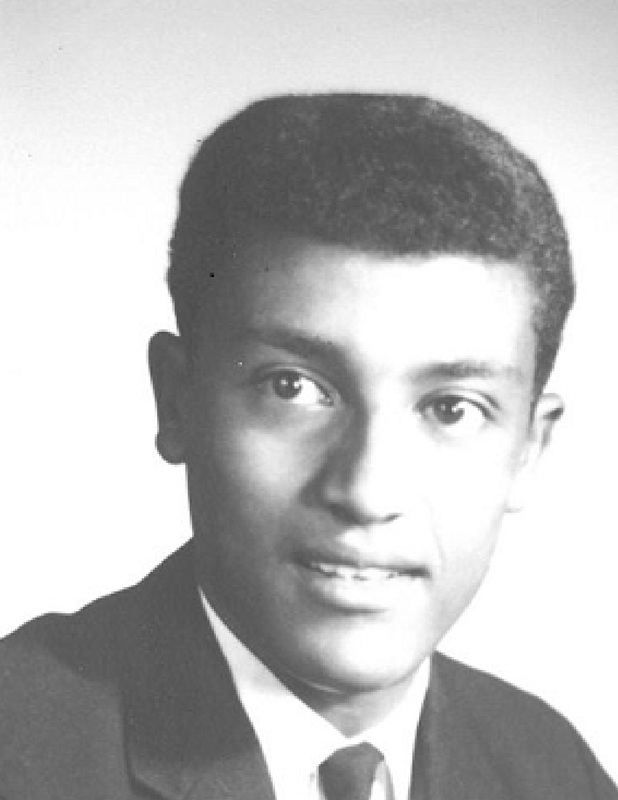 After returning from the United States, where Berhane had spent a year in Ohio as an American Field Service student, living with an American family and attending high school, Berhane earned his law degree at Haile Selassie University and began a highly successful legal career, including service as Presiding Judge of the High Court of Ethiopia. As the years passed, and Haile Selassie’s overthrow was followed by the Red Terror under the dictatorship of the Derg’s Mengistu Haile Mariam, I lost track of Berhane, assuming he – along with hundreds of thousands of Ethiopians – had most likely perished. So reading his email in March 2011 was a joyful experience. 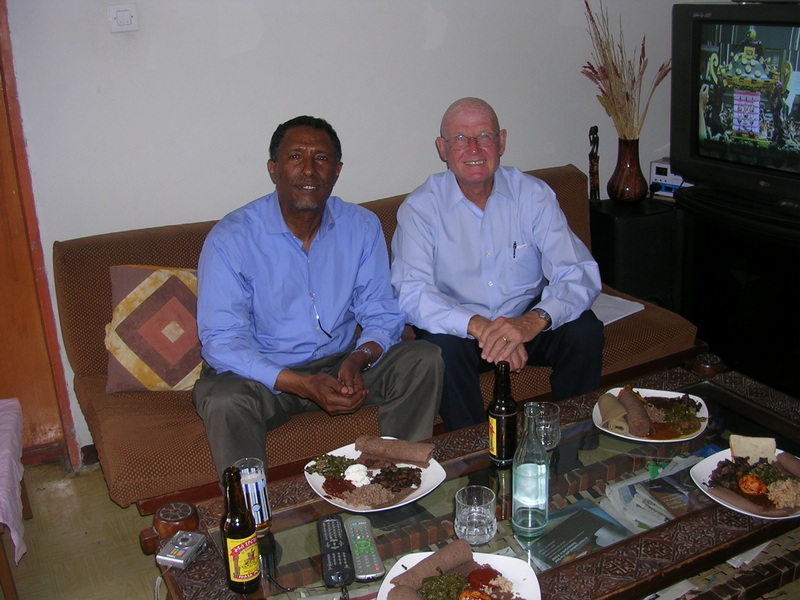 Berhane was a wonderful host on my return visit to Ethiopia in May 2012, driving me and Tesfagiorgis all over Addis Ababa in his car and hosting us in his home. You would have to experience the traffic in Addis yourself to appreciate how indebted I am to Berhane! He kindly agreed to spend an hour in my room at the Jupiter International Hotel in Addis, recording this video, in which he talks about confronting American culture as an American Field Service student in Ohio. 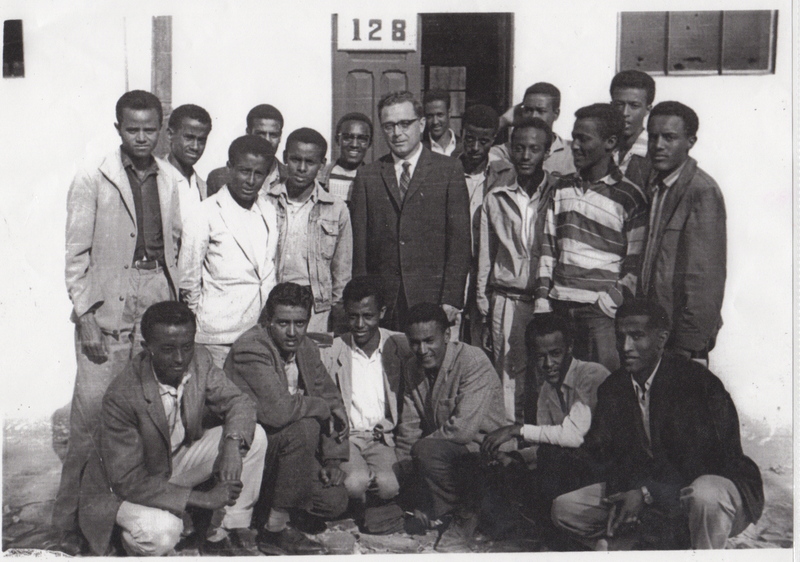 My February 20 post, “A Time of Political Madness,” tells the harrowing true story of my dear Ethiopian friend Tesfagiorgis Wondimagegnehu’s two years in prison under the Derg, the military regime that had overthrown Emperor Haile Selassie and presided over a reign of terror in Ethiopia until 1991. 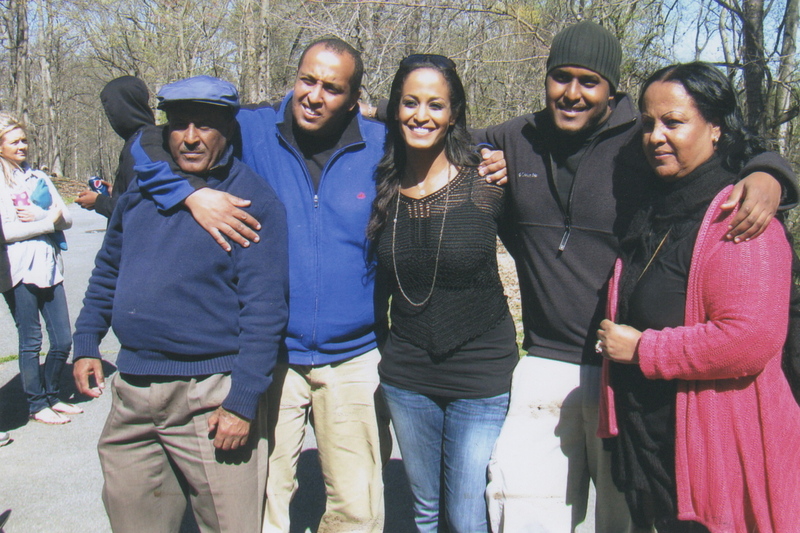 Despite the disruption of his life, his suffering in prison, and his near-execution, Tesfagiorgis was able to resume his career at the Ethiopian Government’s Central Personnel Agency and eventually marry and have a family. 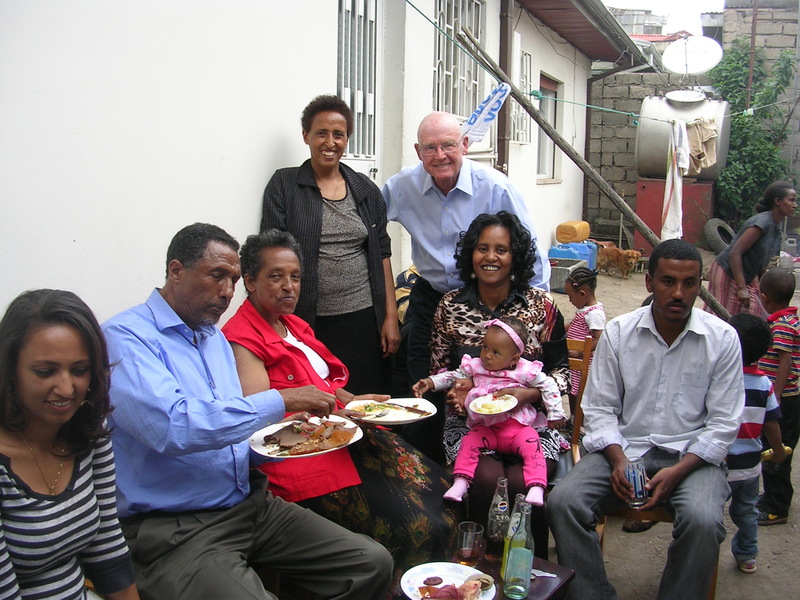 It gave me great pleasure during my return visit to Addis Ababa almost a year ago to see Tesfagiorgis and his wife Almaz enjoying a happy life together in their comfortable home in Addis. The following excerpts from Tesfagiorgis’ recent letter to me tell about his post-prison journey to a fulfilling personal life. 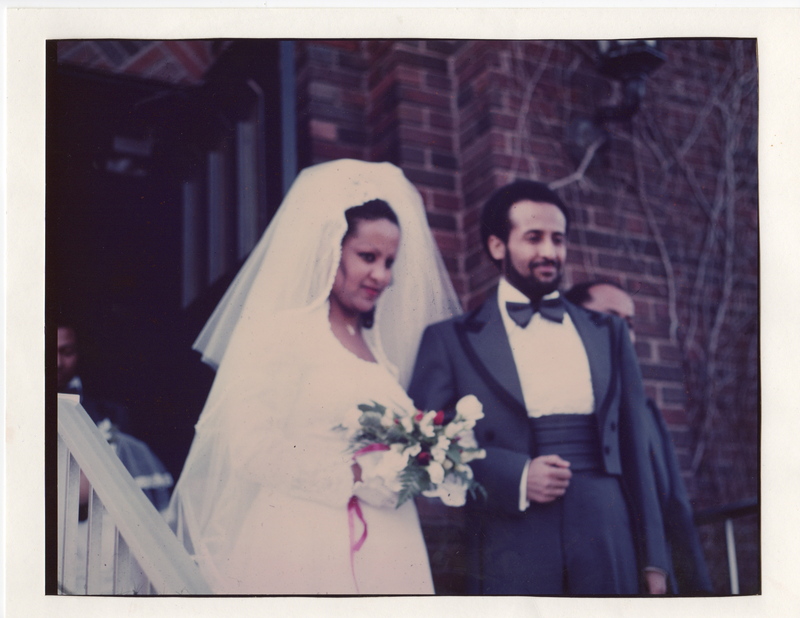 After my release from prison in February 1981, people who wished me well advised me to get married before it was too late. However, it took me almost 10 years to actually get married. In 1986 I went to Italy for short-term training in public service management. There were about 20 trainees who had come from India, Indonesia, Morocco, Madagascar, Ghana, and the Philippines. The majority were younger than me. Many introduced themselves in class as a father or a mother of one or more children. I really felt bad admitting that I was single. Moreover, when we went shopping, many were buying things for their children and their wives or husbands. I was not very clear what to buy and for whom. Feeling somewhat purposeless and empty, I bought some clothes for myself and some gift articles for some friends. After I returned from Italy, I completed the small stucco house that I had started building before going to Italy and began for the first time to live in my own house. I knew some of my close neighbors, and all were married with children, making me feel sort of out of place in the neighborhood. 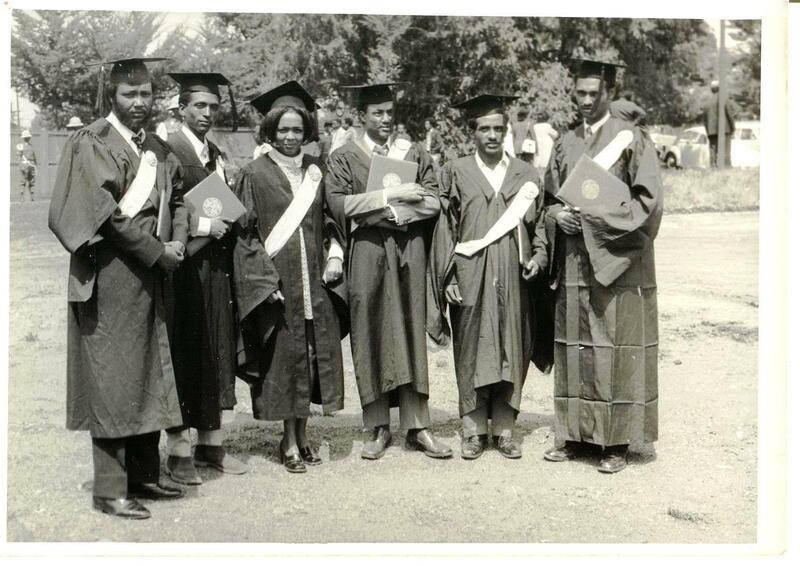 One of my neighbors had in fact been a student at Haile Selassie I University when I was there. It wasn’t long before we began to talk candidly with each other. We are around the same age. He had three children – a boy and two daughters. One day in the evening while I was watering the small trees I had planted outside the fence of my house, he came up and asked why I am watering them. I replied “to help them grow”. He said “Tesfa, we are mortal. You may not live long enough to see them fully grown. You need to have someone very close to you to own the plants and your house and the piece of land with you and share your life “ And he added, “Otherwise it is better to live anywhere in a small rented house”. Furthermore, with many of my friends getting married I felt more and more lonely. My growing unhappiness finally led me to decide to get married. My criteria for my future wife were simple. In addition to being a Christian, slim and at least as tall as I was, she had to be committed to marriage. The younger brother of my old TMS friend is a distant relative of my wife Almaz. He told me about her family and her life and arranged for our meeting. And one day he came to my house with Almaz and introduced me to her. The three of us had lunch together and exchanged our telephone numbers and I walked them home. 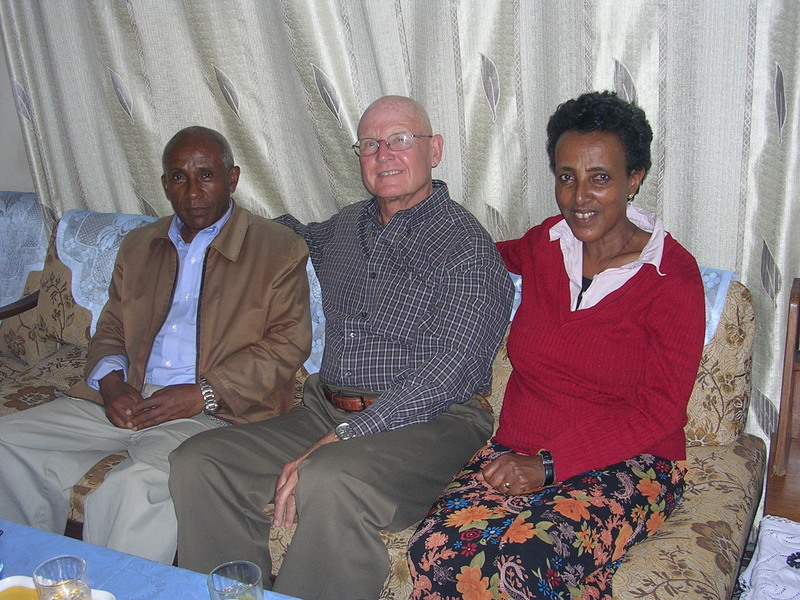 Then both of them visited my home until Almaz felt comfortable enough to come alone. 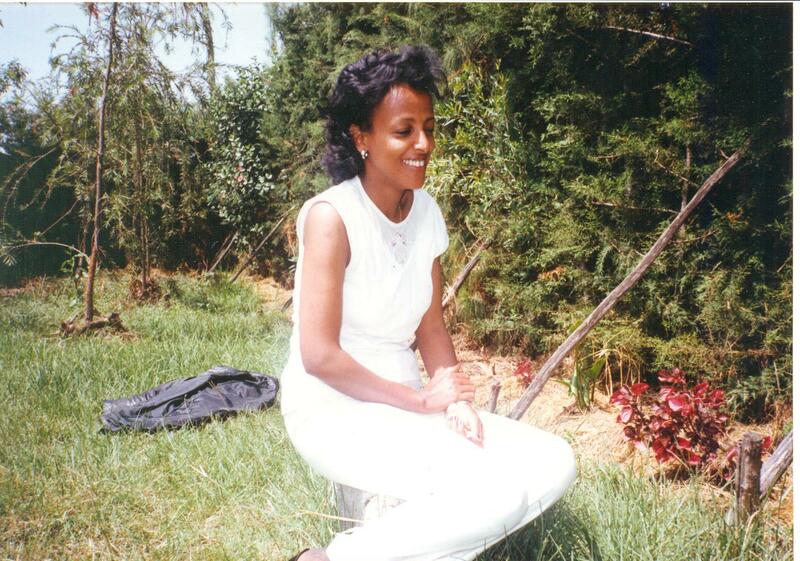 My wife Almaz was born in Addis Ababa very close to Tafari Makonnen School. 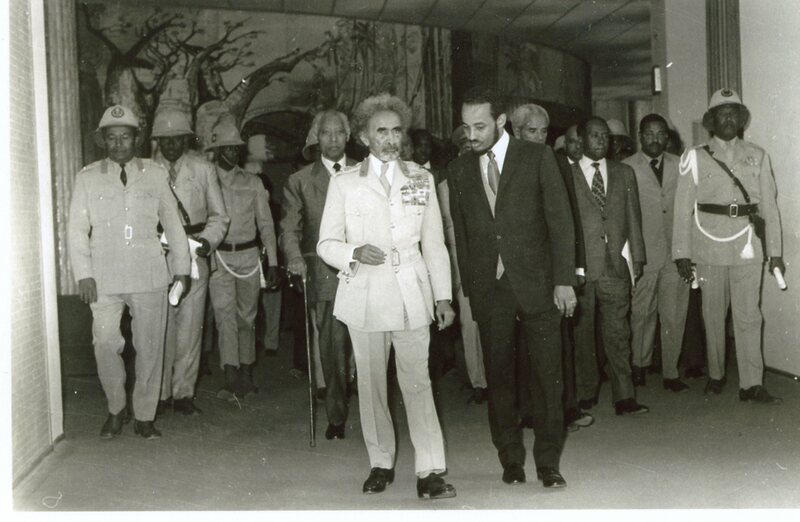 Almaz’s father, who was an officer in the army during the reign of Emperor Haile Selassie, retired not very long after the Derg came to power. Her mother was a house wife. Almaz had completed her elementary and secondary education at Etege Mennen School (named after Emperor Haile Selassie’s Empress). Itege Mennen was the best known girls’ school in the country. The school, now named Yekatit 12 Secondary High School, is located very close to TMS and in front of the house where we used to live, Doug. She is an Orthodox Christian and a regular church goer. I regularly gave her calls and met her at my home and out in coffee houses and restaurants. We talked about different things including the village and the people we knew around TMS, those who were married and about their lives after marriage, and our school lives. After around six months of getting to know each other, I felt pretty certain that Almaz was the right woman for me. In addition to her family background, I loved the way she carried herself, her self- confidence, and her beautiful long black hair. One fine day, when we were about to say goodbye to each other, I said “Almaz, now we know each other so well, we need to talk”. And she looked serious and smiled and said, “Talk about what?” I immediately read her positive feeling inside and replied, “About marriage,” adding “Think about it and say something tomorrow. Ok?” That night I felt I had really accomplished something and was very excited. The next afternoon she came to my house and after lunch and some soft drinks, I raised the marriage issue again. Talking quietly for a while, we looked at each other with love and agreed on our marriage. Then we felt lots of anxiety about what to do next. According to tradition, I sent three elderly people to her parents to request their daughter, Almaz, for marriage. Her parents accepted my elderly representatives, listened to them, asked them about my work, education, habits and the like and finally told them that they would consider the request and give them the reply after a week. This is the tradition. My elderly representatives went to her parents’ house a week later and were warmly received and told that the request was accepted. This was soon followed by a small feast prepared for the occasion. This was the first important step on the way to our marriage. The marriage ceremony included two phases. 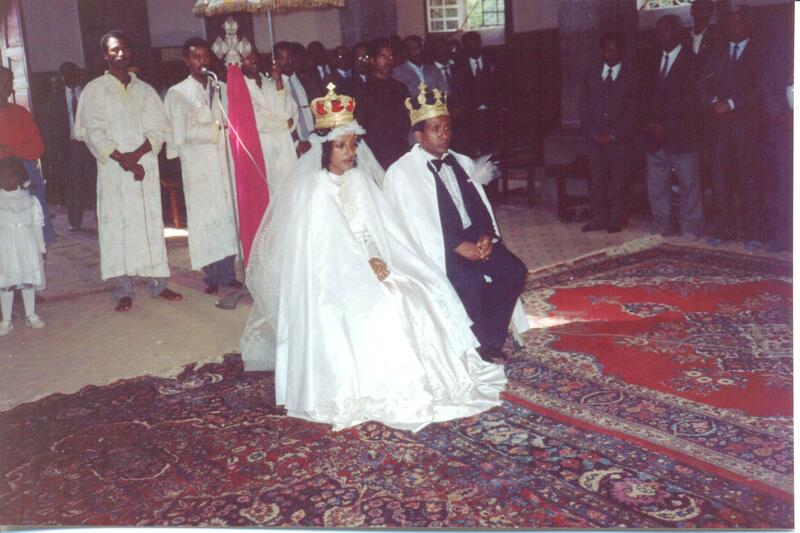 The first was the church ceremony held in Miskaye Hizinan Medhane Alem Church (very close to TMS) on December 5, 1990. 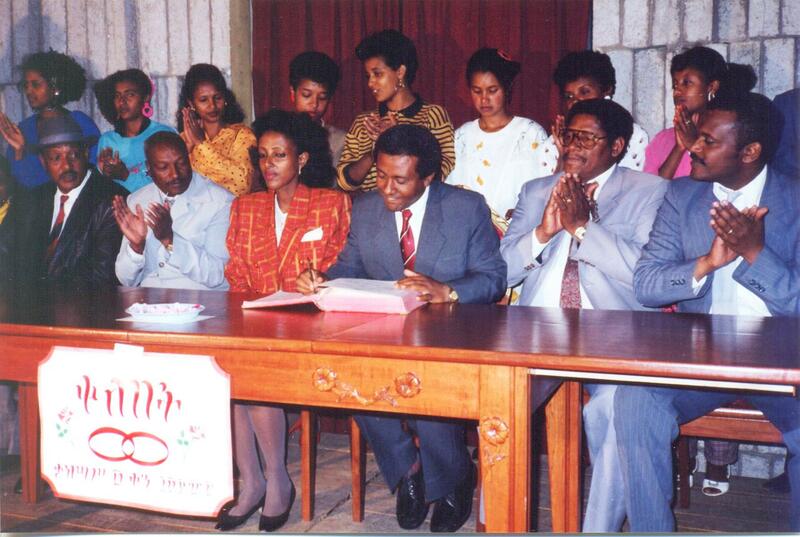 Twenty-six days later, on January 1, 1991, another ceremony was held at the Addis Ababa Municipality. The municipal marriage was followed by joyful celebrations, first at her parents’ house and then at our home, with lots of eating, drinking, singing and dancing. The first two or three years of our marriage were particularly challenging. I was smoking and spending lots of time after work drinking beer with friends. Almaz repeatedly told me to quit smoking even before marriage. I promised but found it difficult to do. I was smoking in hiding from her parents. In our tradition, as you know, you don’t only shake hands with a friend or close relative but also kiss each others’ cheeks to show true affection. I avoided meeting some of Almaz’s close relatives because they would smell smoke on my breath when I kissed their cheeks and would know I was smoking. I felt the pressure and I tried to seriously quit smoking two times – one month the first time and over three months the second. I asked myself “What is wrong with me?” and thought hard what to do. I knew that in both cases I started smoking again while I was drinking beer and chatting with my friends in a bar. The third time I quit not only smoking but also drinking beer and meeting friends in bars. The first few months were terrible. I got easily irritated and was often negative to Almaz and my office colleagues. I was restless and aggressive. I was going to bed early but could not sleep. But this time I succeeded – a huge change in my life that I know resulted from my marriage. Now I was financially better off, spent more time with my family, and was able to be with Almaz’s relatives without worrying. Our daughter, Bersabel, was born on 2 June 1991 and our son, Natnael was born on 26 February 1993. Celebrating the birthdays of our children were special occasions for both of us and relatives and friends. Birthday gifts like new clothes and shoes sent by Almaz’s relatives in the US were longed for and highly appreciated. In the midst of all of this happiness, I sometimes remember my dark days under the Derg, when I would talk with close friends about our dream of being married some day – a dream we didn’t think would come true. One thing I did to the best of my ability was to help my children avoid suffering from the problems I had when I was a child, that is, being unable to speak up, lacking the confidence to have and express their own views, being afraid of making mistakes. I encouraged them to speak freely and loudly and never to worry about making mistakes, but instead to learn from them. You know, I don’t know how to swim, and there were times over the years when I was embarrassed at having to stand by the side of the swimming pool or on the beach, watching swimmers enjoy themselves. So I was firmly committed to making sure my children learned valuable skills when they are very young. For example, I helped them learn tae kwon do (they both are red belt holders). Both learned to swim at the Ghion Hotel pool, and to play musical instruments: Bersabel the guitar and Natnael traditional and religious string instruments – the Begena (David’s Harp) and Kirar, another traditional musical instrument. They are now socially active and doing very well. I feel I have greatly contributed to that and I am proud of it. One of the things I will never forget is something that Bersabel did when she was a baby. We were teaching her to use the potty, and we repeatedly said “potty,” “potty,” “potty” to her and helped her to sit down on, and get up from, the potty. One Sunday when I got home from visiting a neighbor, I found Bersabel sitting in the middle of our living room. As soon as she saw me she smiled and for the first time uttered the words “potty”. I was very happy and said “bravo, my daughter.” Then she stretched her two hands to me to help her get up from the potty. That’s when I saw that she was sitting on my lunch box! This is something I always enjoy talking about and will never forget. The second time I went to Italy I had, unlike my previous visit, a clear purpose for my shopping trips: buying gifts for my wife and children. And when I later visited the US, I was again thinking about what to buy for my wife and children and how to save money to build extra rooms for our house. My wife and children made my trips purposeful and lovely. It is now 22 years and 4 months since we got married. Bersabel, our daughter, now lives in Boston, USA. She is a second year student at the University of Massachusetts-Boston. Natnael, our son, is a second year engineering student at Gonder University. We now live a happy and peaceful life looking forward to seeing our children complete their education, start work and stand on their own feet. My former student Tesfagiorgis Wondimagegnehu and Tesfamichael Tekle, a highly articulate and gregarious fellow with a bright smile and affable manner, have been close friends since their students days at Haile Selassie University. 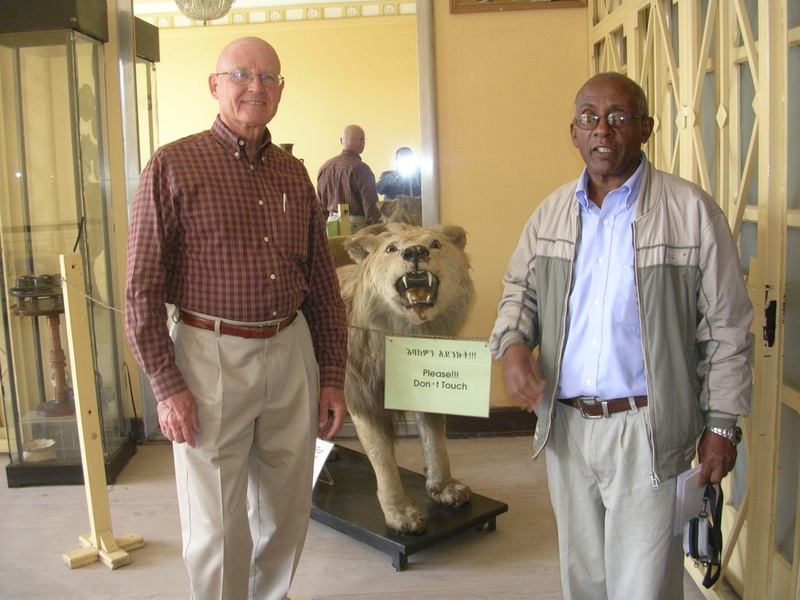 They were professional colleagues at the Ethiopian Government’s Central Personnel Agency (now the Civil Service Commission), and they both spent time in prison under the military dictatorship – the Derg – that succeeded Emperor Haile Selassie. The following excerpts are from the written account that Tesfamichael sent me of his experience prior to and under the Derg. 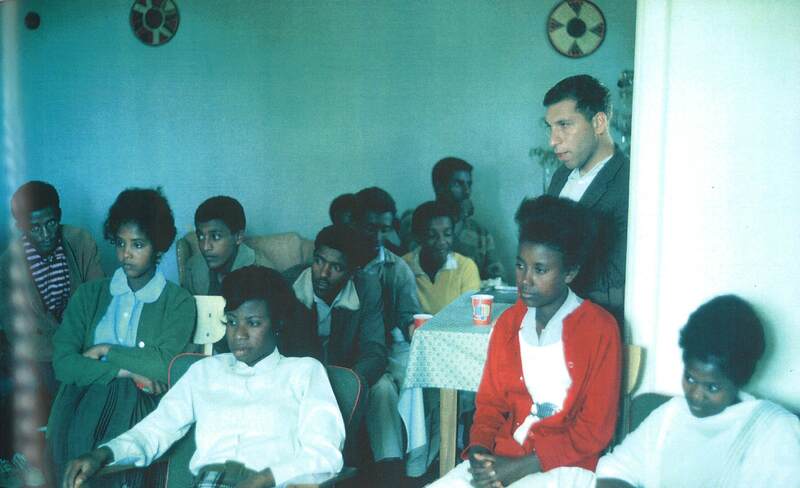 My radicalization started way back in high school during the reign of Emperor Haile Selassie. The clash of college students with the police at the Arat Kilo Science Faculty spilled over, causing major disturbances at my nearby high school, Menelik II. I was beaten along with other high school and college students by police who had jumped into our school compound chasing students, and I was taken to Police Station #1 for detention when I was a tenth grader. If I recall correctly, this happened in 1965. My joining college students in protests against the feudal regime of the Emperor (“land to the tiller” and freedom of speech, etc.) was understandable when you consider my background. 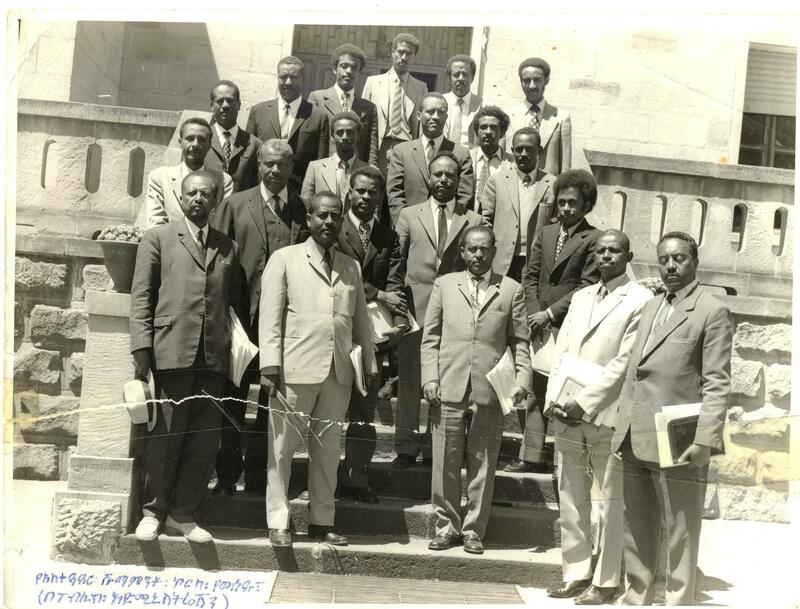 As tenants living on the land of an Addis Ababa landlord, my poor parents, who lived in constant fear of eviction, were subjected to harsh oppression. For example, my parents were forced to plant trees on the landlord’s empty land, which he was preparing for the construction of rental houses. The landlord’s continuous and abrupt threats to evict us are imprinted in my mind, and are the source of my bitter hatred of the then-system and of my rebellious attitude. When he was almost blinded, which he believed was due to my father’s curse, the landlord came to my father to ask for forgiveness for all the mental suffering that he’d inflicted on my parents, but it was too late to make any difference; the old regime was collapsing. Although the Derg did solve the land to the tiller issue that we students were fighting for, it was clear early-on that the military junta would never bring about the freedom of speech, press, and assembly that we passionately desired. This was all too obvious when the Derg killed around 60 former high ranking government officials without a fair trial to consolidate its power. Arbitrary arrests and detention soon grew common, so many of us students joined the EPRP (Ethiopian Peoples Revolutionary Party) and went underground. Many of my colleagues involved in the movement were brutally killed in the streets of Addis Ababa, including close friends. The sound of gun shots was common in Addis Ababa. It was customary to see the corpses of victims in the morning when going to work – a horrible, but very common sight. You can imagine the mental suffering we endured, never knowing what would happen to us in those terrible times. 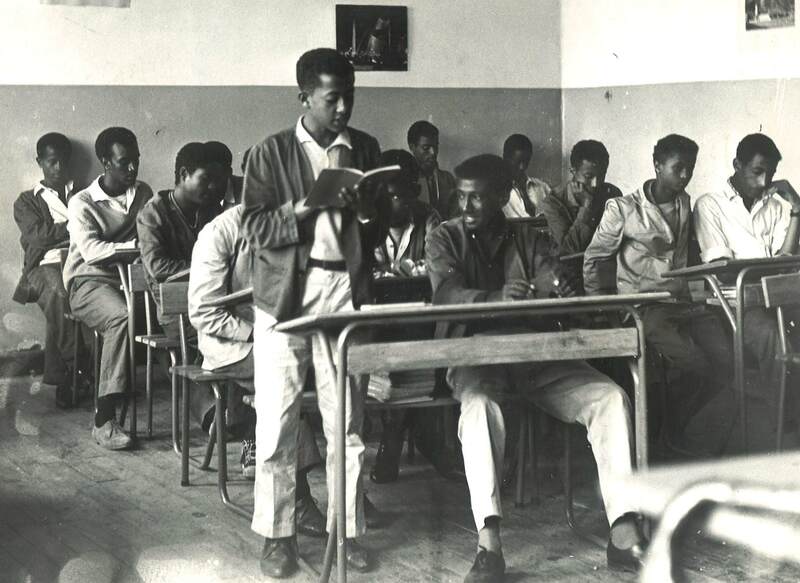 From January to July, 1978 I was an inmate at Higher 18 Prison in the eastern part of Addis Ababa. I’d been taken away from my office one morning, having been surrounded by camouflaged “revolutionary guards” armed with machine guns. Immediately upon arrival, I was seriously warned time and again during my interrogation that I’d be in serious danger if I concealed facts that were later uncovered. Thanks to the absence of modern technology, like the computer, it was extremely difficult to cross-check or verify the results of interrogations. Had they been able to, they would have found lots of discrepancies that would have led to further interrogation and torture and more executions. At the time I entered Higher 18, there were over 1000 prisoners. We all slept in a corrugated iron building on mattresses in rows on the floor. As the heat intensified, it was suffocating. I heard the crying of tortured people practically every night for more than a week until they moved us to other smaller rooms. The torture, of course, continued the same way even after we were moved. In the mornings when I woke up, I used to see tortured people unable to move because of their severe wounds. I’ll never forget how horrifying it was to wake up one night to see armed men (who when they saw me signaled that I should remain quiet in bed) searching for a fellow sleeping only three or four prisoners from me, whom they took out and executed. We were told the next morning that the fellow I’d seen taken out was one of twelve prison mates who had been executed that night. Those days were really terrible to me and my generation. It disturbs me even now to think about that time under the Derg, when I lost a brother and close friends. Remembering those days sickens me, so I try to avoid thinking about that time and substitute more positive thoughts. One thing that sticks in my mind vividly is the reflection of the early morning sun in the blood of executed people. They used to leave the corpses lying in the open for hours as a way of intimidating people. What a government! I am very bitter about it. As I said, I try to keep memories of those terrible times out of my thoughts. Even writing this down brings back the horror and is really painful. Prisoners were physically and morally abused; there were no charges, no witnesses, no defense, no appeal, no complaints, no accountability for torturing and killing people on grounds of suspicion and for executing prisoners who had surrendered themselves to authorities. It was a time of political madness. My Ethiopian friend Tesfagiorgis Wondimagegnehu – who, as you might recall, lived with me and my Peace Corps house mates for 2 ½ years in Addis Ababa while he studied and we taught at Tafari Makonnen School – is talking about his two years in prison in the late 1970s under the military regime – the Derg – that had overthrown Emperor Haile Selassie I. 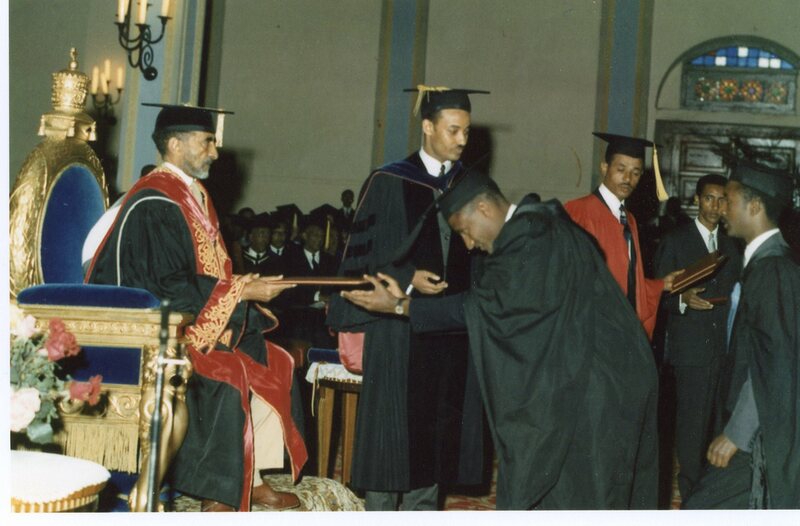 You might also recall that after graduating from Tafari Makonnen and Haile Selassie University, Tesfagiorgis began his career at the national government’s Central Personnel Agency. 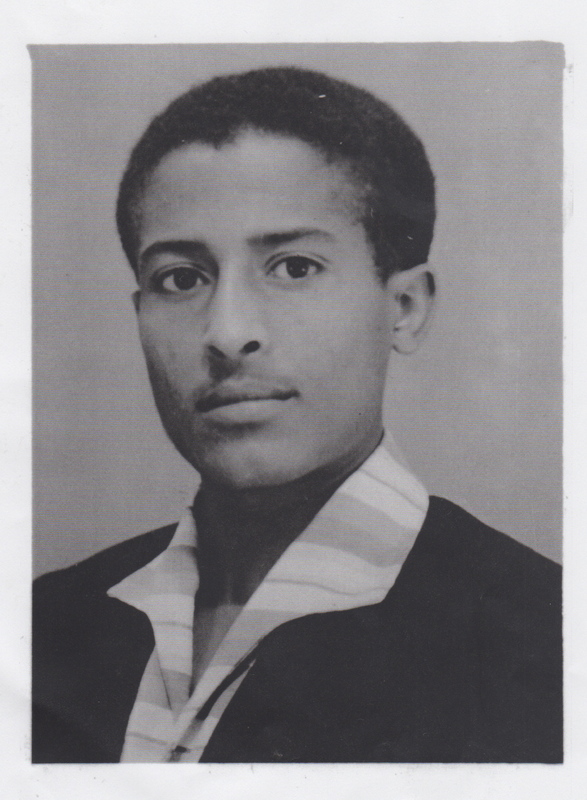 In my last blog, I talked about the incredible double life Tesfagiorgis lived before he was arrested and imprisoned in February 1978: serving as head of his kebele (a Derg governmental unit also known as an urban dwellers association) while also working against the Derg as a member of EPRP (the Ethiopian People’s Revolutionary Party). In this blog, I tell more about Tesfagiorgis’ prison experience and then share my own thoughts and feelings about that dark time. As you can imagine, friendship helped mitigate the harshness of life in Higher 16 Prison. Tesfagiorgis describes mealtimes as a bonding experience. “We used to eat in groups in our prison cell sitting on the edges of our mattresses. 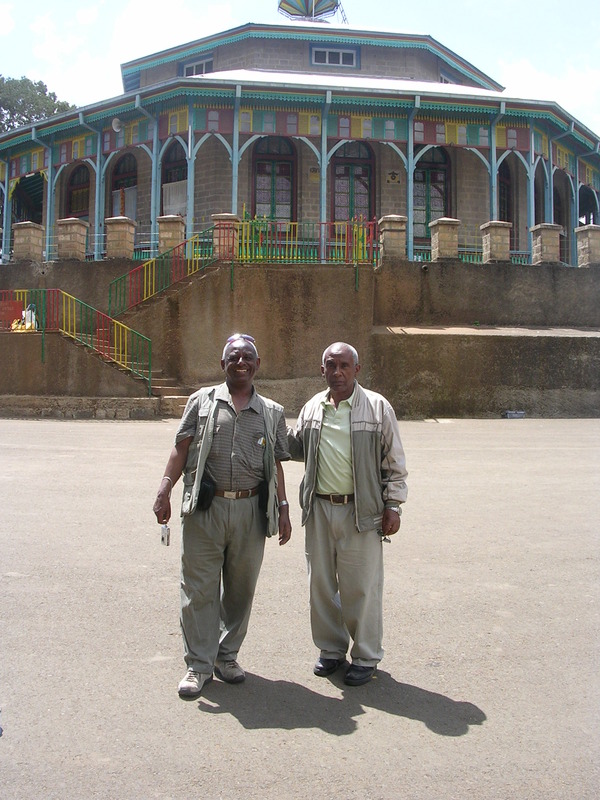 Deciding which dishes to save for dinner and which ones to eat for lunch and putting the food of different prisoners on a common tray and sitting around it and eating together strengthened our friendship and created a strong sense of friendship.” Tesfagiorgis recalls making six new close friends in prison: a high school geography teacher and father, who was executed; four high school students, one of whom was executed, one – now dead – who became a higher school teacher; and two who became government administrators; and a government manager who later worked in private business. 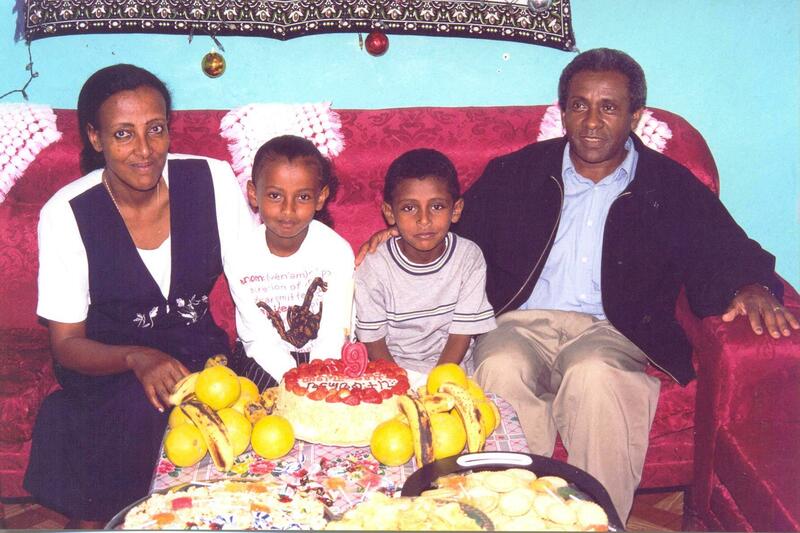 Tesfagiorgis’ two years in Higher 16 Prison came at a high price, as he pointed out in a recent letter: “My political involvement and imprisonment diverted my attention from advancing my career and improving my personal life. I lost my work and income during my two-year stay in prison and endured lots of worry and mental torture. I might have gotten married early enough to have become a grandfather by now.” However, I think it’s fair to say that Tesfagiorgis is nonetheless fortunate and, as he’s said, blessed. 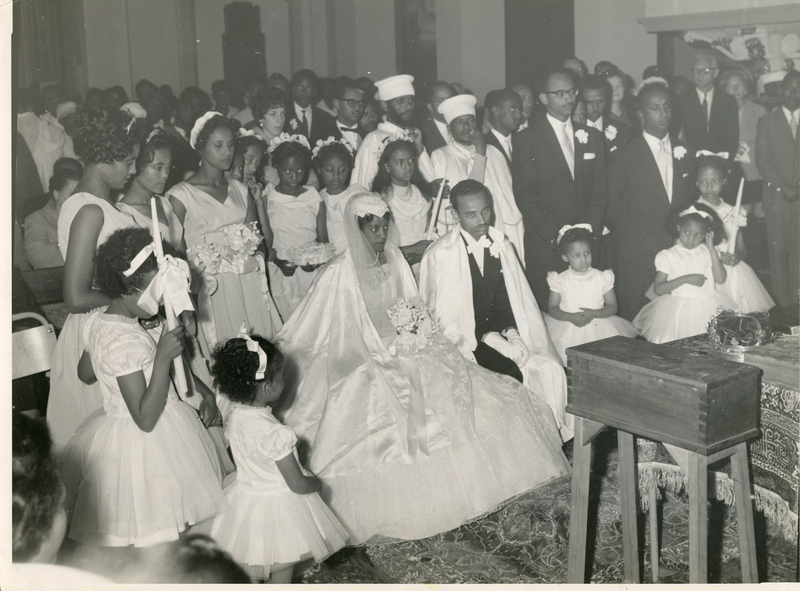 After all, thousands of Ethiopian of his generation were brutally tortured under the Derg, and he wasn’t, and thousands died while he lived – to resume his career at the Central Personnel Agency, marry Almaz Aklog, and with her have two children, Bersabel and Natnael. In many long conversations with Tesfagiorgis during my visit to Ethiopia last May, and in our subsequent correspondence, I’ve been struck by his lack of bitterness at the price he – and Ethiopia – paid under the Derg. He – and other Ethiopians I talked with during my visit, including Tesfagiorgis’ friends Berhane Mogese and Tesfamichael Tekle – don’t have any desire to dwell on past wrongs, preferring instead to look to the future with what you might call guarded optimism. Here’s Tesfagiorgis on the future: “My attitude towards the future is positive. 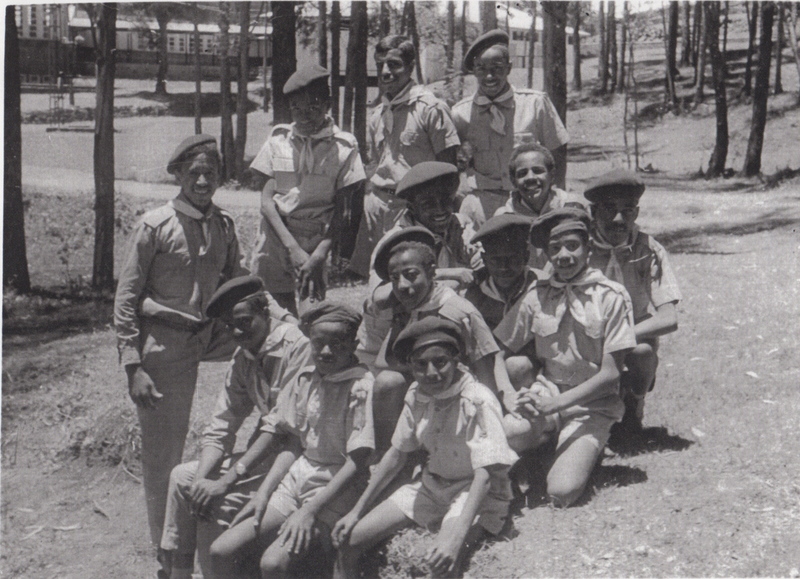 Future generations have the opportunity to learn from the political events that took place after Emperor Haile Selassie’s reign ended, and they can also use technology to learn more about the world and their own country.” In the same letter, to my surprise, Tesfagiorgis also enumerated what he saw as some of the accomplishments of the Derg, including the destruction of the feudal system – “one of the most popular and fundamental demands of the people” – a “commendable job” of reducing illiteracy, and the absence of corruption. It will be interesting as others from Tesfagiorgis’ generation weigh in to have their assessment of this dark time in Ethiopian history. Tesfagiorgis and I spent six to seven hours over the course of two days in my room at the Jupiter International Hotel during my visit to Addis Ababa last May. We sat in facing easy chairs as I filmed him telling about the double life he’d led as chair of his kebele and his imprisonment under the Derg. 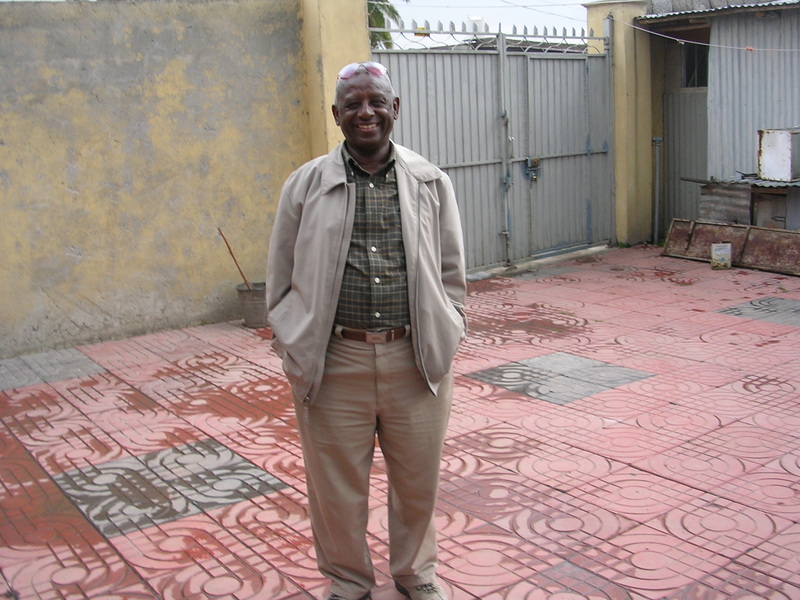 Sitting across from Tesfagiorgis, I could see the 17 year old boy I’d said goodbye to in 1967, when I returned to the States after my three-year stint as a Peace Corps teacher, in the face of the 62 year old man facing me. It really hit me then that I’d loved that boy – and now this man – like a little brother, and that I was truly blessed to reunite with him 45 years after our parting and some 38 years after losing touch completely. As we talked in my hotel room, on our travels around the capital city, and over many meals of injera and wat – painting in the canvasses of our lives for each other – I was often roiling with emotion: deeply sad at times and viscerally angry at others. Sad and angry that someone I love had suffered so much so needlessly, that this fundamentally good-hearted, gentle, highly moral human being had been treated so hideously. Also sad and angry over the unfulfilled promise and thwarted dreams, not only of Tesfagiorgis but also of his generation of Ethiopians. 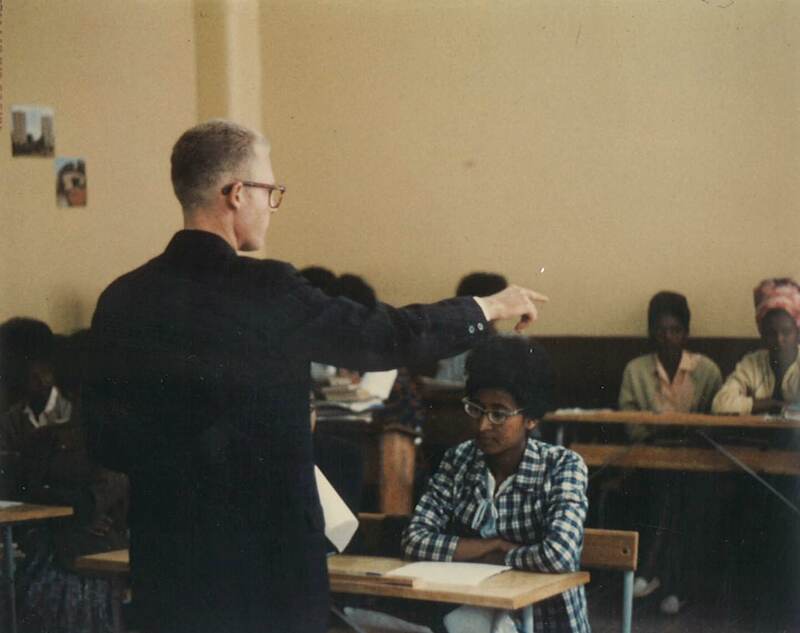 He and his compatriots had been educated to lead Ethiopia’s development in the post-Haile Selassie era – at least that’s how I and many of my Peace Corps colleagues at Tafari Makonnen School and other secondary schools around the country saw our work in the classroom. Our former students were the elite, desperately needed few who’d graduated from secondary schools and gone on to earn university degrees. Freshly minted degrees in hand, they’d entered the adult world with bright promise and high hopes for their country and their lives, only to have their dreams dashed in less than a decade. Even though many, like Tesfagiorgis, managed to survive the Derg and build productive careers and rich personal lives, they, it seems to me, were in a real sense a lost generation that, in their prime, missed the opportunity to lead Ethiopia’s transition in the two decades after Haile Selassie’s overthrow. 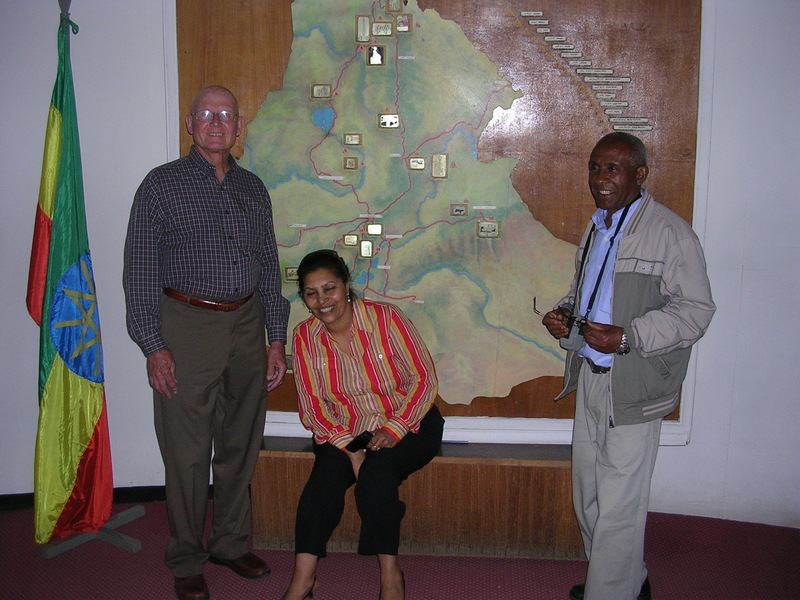 God knows, their loss was equally Ethiopia’s – a huge price for such a poor country to pay. Could the United States, have done more to pave the way for an orderly transition from Haile Selassie’s feudal monarchy to a more modern, more or less democratic government? That question has nagged at me over the years. It seems inconceivable that the violent overthrow of the Emperor could have come as a surprise to our State Department; after all, the regime had been tottering for years. 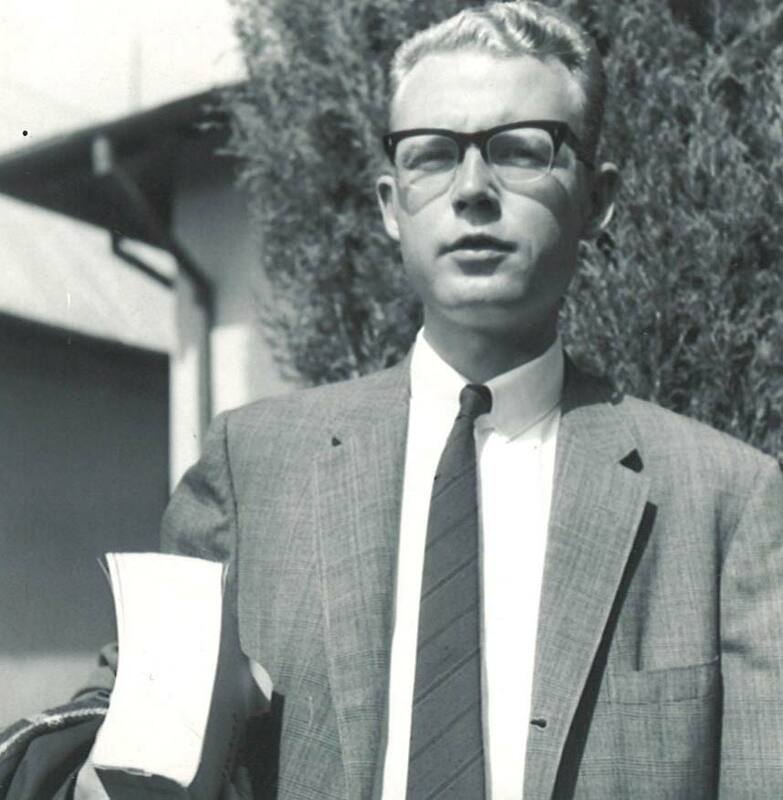 My Peace Corps house mates and I certainly hoped that we’d be safely back in the States before the Emperor died or was overthrown since the potential for chaos and widespread violence seemed such a clear and present danger. But whether the US Government could have played a stronger role in shaping events isn’t clear. After all, our experience in the years since World War II has proved that nation building is an extremely complex, high-risk game easily lost despite the best of intentions. I’d certainly like to hear from anyone reading this who’d like to weigh in on the question. 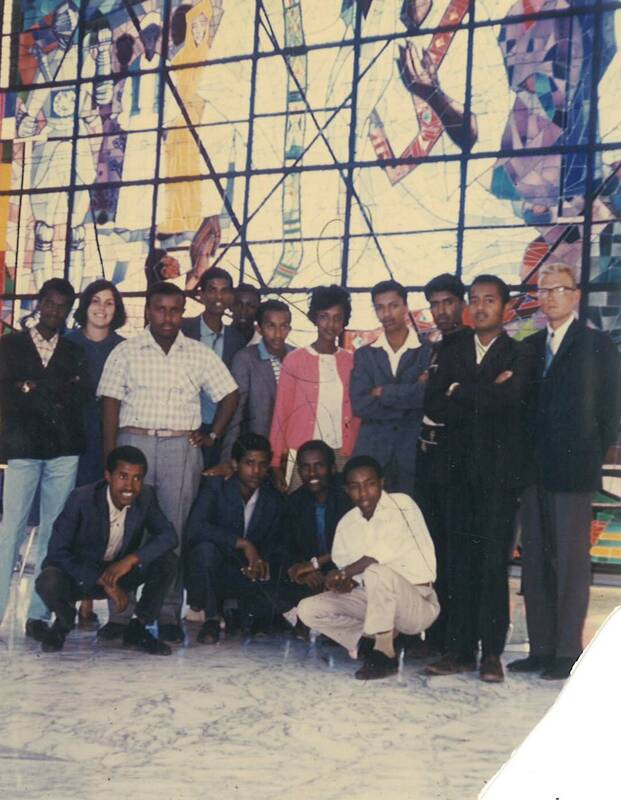 In this blog post, I return to the story of my dear Ethiopian friend, Tesfagiorgis Wondimagegnehu, who lived with me and my Peace Corps housemates for 2 ½ years in the mid- 1960s in Addis Ababa, while he was studying and we were teaching at Ethiopia’s most prestigious public school, Tafari Makonnen. 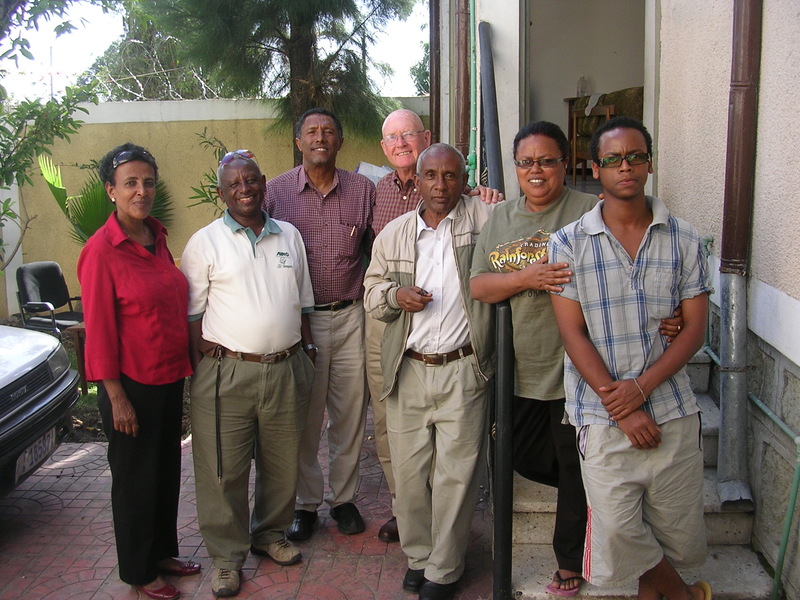 If you’ve read my fourth “Entwined Lives” blog post – “Tesfagiorgis’ Story: The Dark Days” (August 9, 2012) – you know that I hadn’t been in touch with Tesfagiorgis for almost 40 years when, with the help of another Ethiopian student who’d lived with me in Addis, Tariku Belay, I reunited with Tesfagiorgis by phone in March 2011, and in person at Bole Airport in Addis last May, on my first visit to Ethiopia since returning to the States in 1967. Reuniting with Tesfagiorgis, along with another recently discovered Ethiopian friend from almost 50 years ago, Berhane Mogese, last May packed an especially powerful emotional punch because I’d thought they, along with many former students, had most likely been executed under the brutal military regime that had overthrown Emperor Haile Selassie I in 1974. Our re-uniting after so many years was, as Tesfagiorgis aptly observed, a real miracle when you consider those dark days Berhane and Tesfagiorgis had lived through. You might also recall from my “Dark Days” blog post that after his graduation from Haile Selassie I University in the mid-1970s, Tesfagiorgis joined the Ethiopian Government’s Central Personnel Agency as a mid-manager and began to lead a dangerous double life: serving as Chairman of one of the 283 urban dwellers associations – known as “kebeles” – that the Derg had created, while also actively working undercover against the Derg as a member of the opposition Ethiopian Peoples Revolutionary Party (EPRP). 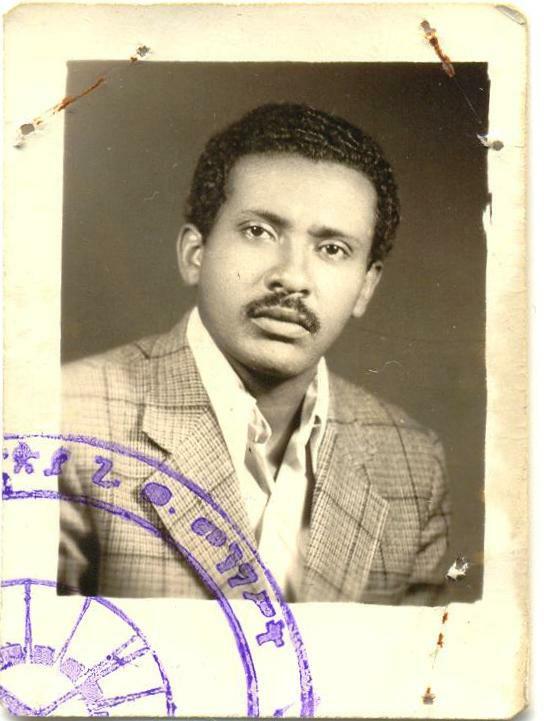 This extremely stressful double life came to an end early in the morning on February 3, 1978, when Tesfagiorgis was arrested and taken to Higher 16 Prison in Addis, where he spent most of the next two years. In this and my next blog post, I’ll tell you about some of Tesfagiorgis’ experiences as a kebele chairman, and then you’ll learn more about Tesfagiorgis’ two years in prison. Preparing for my trip to Ethiopia last May, I found a copy of the June 1967 issue of the Tafari Makonnen School Ensign in my files. Thumbing through it, I found this profile of twelfth grader Tesfagiorgis Wondimagegnehu: “Short, but strong as a bull. Don’t stand in his way when you play football with him! But his good temper makes up for his roughness.” That’s my extraordinary Ethiopian friend in a nutshell: tremendously hard working and tenacious, but at the same time even-tempered, affable and good humored – one of those extroverted people-centered persons who naturally attract friends. It’s not surprising that, despite those traumatic dark days under the Derg, Tesfagiorgis was able to work his way up to an executive position in the Central Personnel Agency before his retirement after a 28-year career: Head of the Planning, Policy Analysis and Review Department. And these traits, along with a generous dollop of good luck, undoubtedly explain how Tesfagiorgis was able to survive for so long as chair of his kebele while secretly working against the Derg. Heading one of the kebeles in Addis Ababa didn’t give Tesfagiorgis immunity from the Red Terror, which could strike at any time without warning, catching victims up in a net from which thousands didn’t escape. As a couple of Tesfagiorgis’ real-life stories attest, his life more than once hung by just a thread despite his leadership position. As it was dark outside, I couldn’t properly see the soldier at the window. The door was violently opened and two soldiers pointing their machine guns entered the house one after the other. We stayed seated. The first shouted “Stand up and hands up”. We obeyed fast. The second rushed into the other room of my house. We were searched and told to stay outside. The second shouted “There is one more in here”. I did not know that my friend Gebrehiwot was sleeping in the other room of my house. He came out wearing his eye glasses and holding his hands up. Two young neighbors who were working in public companies joined us outside. There were 9 of us out in the compound, along with 8 or 9 soldiers. The women were told to return to their homes, and the remaining five of us were led out of the compound and taken to a military truck parked in front of Beza’s shop. Three people were already on the truck. One was the wife of Ato Yewlchaf, who was later killed in the Merkato area of Addis (a huge open air market) by security forces. One of the two men seemed to have been taken out of bed and not given time to dress himself and was shivering. The third was sitting in one of the front corners of the truck with his head down. We joined them. Then the truck was driven fast in the direction of Entoto Mountain, nearly reaching the foot of the mountain. I thought, as often happened, we were going to be summarily executed and buried there. But the truck turned around and came back via the American Embassy to Arat Kilo and entered the Grand Palace. That was where the notorious Derg’s Investigation Bureau was located. We had no idea why the truck had made such a meandering trip. We were then told to get down from the truck and join others who’d been arrested. We were all commanded to stand in line and taken some distance and then ordered to get into a narrow and very dark ditch almost as deep as my height. It was about 10:00 p.m. and very dark. We didn’t know where the ditch would take us or what we were stepping on. We were simply following one another and slowly moving forward. At the end of the ditch there was a kind of stairway. As soon as a suspect came out of the ditch, he was told to stand on a podium about five meters away from the mouth of the ditch. A very powerful beam of light was then put on the face of the suspect and it was very difficult for the suspect to open his eyes and see and identify the persons in front of him. Each suspect on the podium was ordered to stand straight, to turn his face left and right, to tell his name, age, work, kebele etc. and finally told to go to group A or group B and sit on the ground. Beza was in front, Gebrrehiwot was next and I was third in our group. Beza was on the podium and questioned and told to join group A. I knew Beza was older than all of us and was head of a large family. I assumed he wasn’t involved in politics. Also, he was very likely known by some of our captors who’d eaten in his small hotel close the Palace. So I said to myself that it would be better to go to join Beza’s group and waited for my chance. Then Gebrehiwot came out of the ditch and stood on the podium. The beam of light was on his face. He was ordered to remove his eye glasses and did all the rest and was sent to group A. My turn came and I did the same and according to my guess work I was luckily told to join group A. All the suspects went through almost the same process and were divided into the two groups. It was about midnight. The chief investigator came to our group and made a threatening speech and gave a stern warning that if anyone of us told anyone about what’d happened to us that night, he would certainly be brought back to the same place. Then we were put on a truck and dropped off at our kebele at about 1:30 a.m. The woman prisoner in our group was unfortunately dropped at a police station on our way home. Group B prisoners were not fortunate. Some were thrown into prison and left there for years. One Saturday afternoon Tesfagiorgis met a friend of his, Tesfaye Ayele, the youngest brother of an old friend from Tafari Mekonnen School. 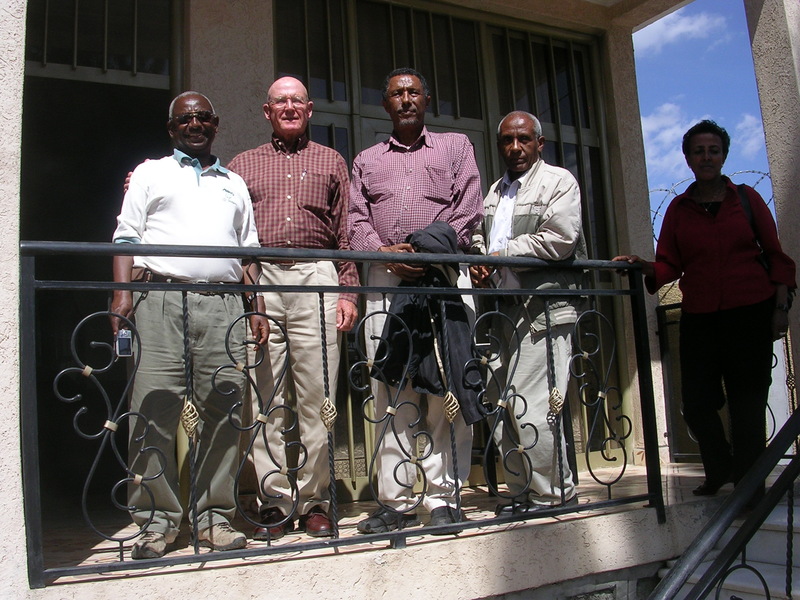 They ate lunch together and sat talking and drinking beer until about 9:00 p.m. at the Fasika Hotel. Worn out, they decided to spend the night at the Fasika. Tesfagiorgis had been asleep for a few hours when another harrowing adventure began. Here’s the story in his words. It was about 1:00 a.m. I felt something very cold on my forehead. I woke up and saw a tall man in uniform standing by the side of my bed and aiming at my head with a hand gun. It was the gun that I’d felt on my forehead. He told me to dress fast and get out of the room. I did. It was very cold outside. Everyone spending the night at the hotel were out there in the compound of the hotel. I joined them. The light in the compound was very dim. Each and every one of us was searched and ID cards checked. Many were told to go back to their rooms including my friend Tesfaye Ayele. A young man who was claiming to be a relative of the owner of the hotel and myself were taken by 3 armed revolutionary guards to a nearby kebele and thrown into a small room possibly three by three meters. The room was so dark we couldn’t see each other, nor could we tell if anyone else was in the room. Using my hand as a guide and touching the wall to my right, I found the corner and leaned back in silence. But my roommate was moving here and there and stumbling on something. He was shouting and complaining. I was really worried that someone would hear the noise and come to question us, or worse, but nothing happened for the rest of the night. At dawn, some light began to come in through a small window close to the ceiling of the room. The room had brick walls. There was only one wooden bench and a chair in the middle of the room. The walls to the right and to the left, the bench and particularly the floor were stained with blood. We were almost certainly sitting in a torture chamber. Those who’d been tortured were either dead and disposed of or taken away for execution. Then early in the morning I heard an announcement by megaphone of a meeting of all kebele residents to be held at the kebele office at 8 a.m. Kebele meetings were normally held on Sunday mornings and lasted for hours. My roommate began shouting louder to make our presence known and hopefully get us released before the meeting began. Not only was the torture chamber a terrible place to wait, we were also terribly anxious about being confronted by guards who’d been brutalizing suspects the night before. Someone opened the door about 4:00 p.m. and asked us why we were there and who’d locked us in. We told him the story, but couldn’t identify our captors. . He locked the door again and walked away. This time I was really worried and frightened, ready to start shouting like my roommate had. Some thirty minutes later the man came back, handed us our ID cards, and explained that we’d been detained because our names on our ID cards couldn’t clearly be read in the dark last night. Then we were released. Hearing his stories, I realized that it truly was nothing short of a miracle that Tesfagiorgis lived to participate in our reunion in Addis Ababa in May 2012!